Metastatic studies on rats showed that after subrenal implantation of tumor cells under the capsule of the kidney or subhepatic implantation under Glisson’s capsule of the liver generated primary tumors in these organs. 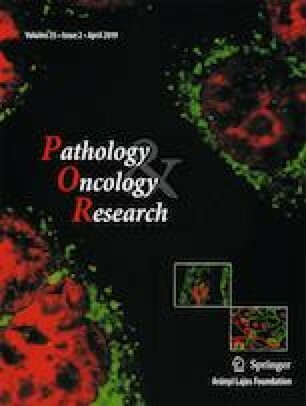 It was assumed that tumor cells that escaped through the disrupted peripheral blood vessels of primary tumors entered the peritoneal cavity, crossed the diaphragm, and appeared in the thoracal, primarily in the parathymic lymph nodes. This explanation did not answer the question whether distant lymph nodes were reached via the blood stream from the primary tumor or through the thoracal lymphatic vessels. In this work, we investigated the metastatic pathway in C3H/HeJ mice, after direct intraperitoneal administration of murine SCC VII cells bypassing the hematogenic spread of tumor cells. The direct pathway was also mimicked by intraperitoneal injection of Pelican Ink colloidal particles, which appeared in the parathymic lymph nodes, similarly to the tumor cells that caused metastasis in the parathymic lymph nodes and in the thymic tissue. The murine peritoneal-parathymic lymph node route indicates a general mechanism of tumor progression from the abdominal effusion. This pathway starts with the growth of abdominal tumors, continues as thoracal metastasis in parathymic lymph nodes and may proceed as mammary lymph node metastasis. István Juhász and Gáspár Bánfalvi contributed equally to this work. The SCC VII tumor cell line was kindly provided by Prof. Reinhard Zeidler, University of Munich, Helmholtz Zentrum. The research was supported by the EU and co-financed by the European Regional Development Fund under the GINOP-2.3.2-15-2016-00005 to IJ. Conception and design: G. Banfalvi, G. Kiraly, G. Nagy, I. Juhasz. Collection and assembly of data: G. Kiraly, G. Nagy, Z. Hargitai, I. Kovacs. Data analysis and interpretation: G. Banfalvi, G. Kiraly, G. Nagy, I. Juhasz. Manuscript writing: G. Banfalvi, G. Kiraly, G. Nagy, I. Juhasz. Final approval of manuscript: I. Juhasz, G. Banfalvi, G. Nagy. Accountable for all aspects of the work: G. Banfalvi, I. Juhasz, G. Nagy.